AS IT STANDS: Why do some so-called patriots fear the Spanish language? Why do some so-called patriots fear the Spanish language? Why is it that some so-called patriotic Americans get upset when Hispanics speak their native language? This clip shows a Southern California woman berating Norma Vasquez and her son Carlos for speaking Spanish amongst themselves at an IHOP. She chose to tell this Salvadorian family to go back to Spain because they weren’t conversing in English. If they spoke another language – like French or German – I seriously doubt that “patriotic” lady would have said anything. It takes some real hutzpah for someone to proclaim their own views as being "patriotic" while outright dismissing the rest. That First Amendment right that allows someone to tell people off is the same one that allows people to speak whatever language they want, without being asked to leave the country. Let's look at why English is spoken in America. Let's look at the pilgrims. Pilgrims were thrown out of England. A fact that bears repeating — they were thrown out of England. In the Americas these rejects took root and their intolerance and confidence bloomed so much so, that not only did they disregard entire populations already living for centuries on this land, they decided to demonize every new wave of immigrant that landed on these shores. 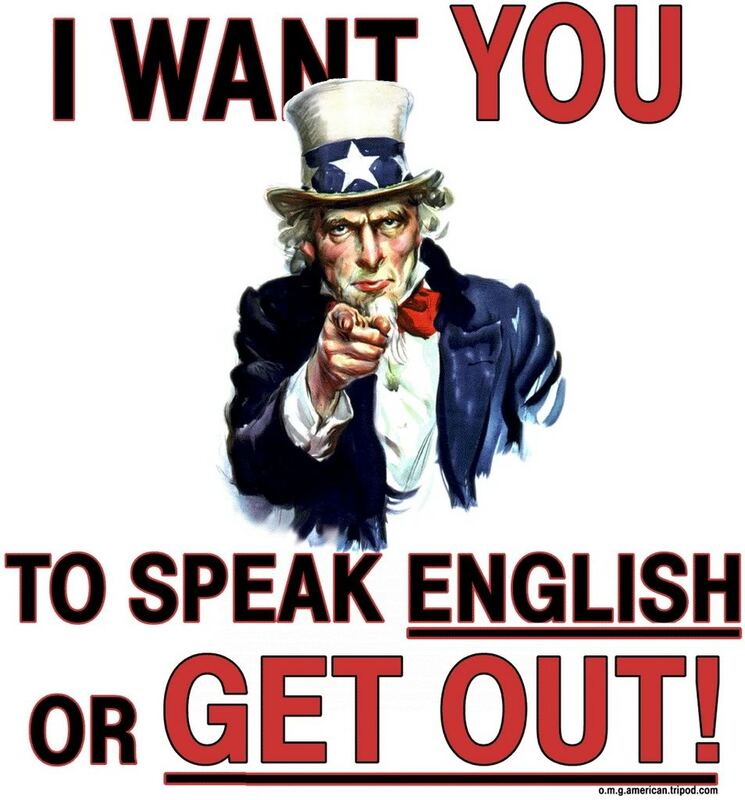 The lie that America is 'white' and should only speak English in order to be 'great' has been perpetuated ever since. It's so ingrained in our national development that we've all accepted it as a default even though it's a fabrication. If you think it may be a select few that are so willfully ignorant, look at Donald Trump's poll numbers. The guy has yet to present a viable policy point. Yet all he's had to do to jump miles ahead in the primary race was to declare that Mexicans are rapists and criminals. The woman’s outburst against the mother and son can be blamed on the divisive seeds being planted by GOP presidency hopefuls, struggling to "out-patriot" others in the political race to the bottom. But 'the Donald' didn't start this ugly, he just gave people a target and a license to attack it. I don't know why some parts of 'English America' are so intimidated by Latinos. They – and the native Americans - were here before the pilgrims. This was their land before it was taken away from them. Unfortunately, this country is politically polarized today and still infected with racism. What the pilgrims started still divides us. The “Great Melting Pot” only a myth perpetrated by propagandists.